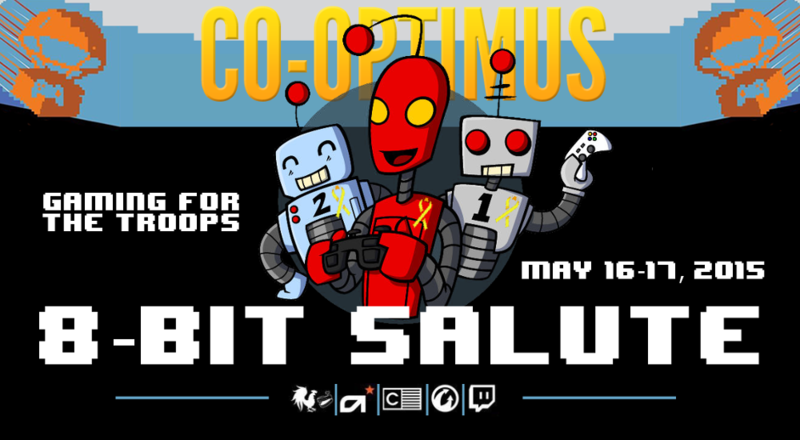 Next month, Co-Optimus staff and community will be participating in Operation Supply Drop's 4th Annual 8-Bit Salute. We're hoping to put together a team of co-op gamers (like you!) to attempt a 24 hour marathon of gaming for our troops. Of course, it's not all fun and games, we're raising money to send gaming-filled care packages to our troops who are risking their lives to defend the US and her allies. These courageous folks are under continuous stress, and could truly benefit from a mental escape that gaming often provides. Operation Supply Drop, founded in 2010 by Steve Mechuga, has been putting together such care packages for several years now, and sending them to troops in active war zones. Some of the contents of these care packages are donated by developers, publishers, or other gaming-related companies, but 8-Bit Salute is designed for gamers to pitch in and fund even more care packages. Polygon put together an excellent video where Steve explains why he does what he does. It's a bit long, but I highly recommend watching it. If you're familiar with Extra Life, 8-Bit Salute is basically the same thing, only for troops. All you need to do is sign up, optionally join a team, and then ask your friends and family for donations. Then on May 16th, pick up your controller and play games for 24 hours. I invite you to join the Co-Optimus team and play with us on game day. Right now there is a huge military suicide problem with veterans and active duty soldiers who just can't cope with what they have been through. July of last year the suicide rate in Afghanistan was higher than the killed-in-action count, over 150 suicides. That is a huge problem. The problems are real, the solutions are unclear, but games can help. We may not be able to bring them home, end wars, or eliminate PTSD, but Operation Supply Drop is giving us the opportunity to at least alleviate some of the stress. Let's do our part! Page created in 0.8110 seconds.